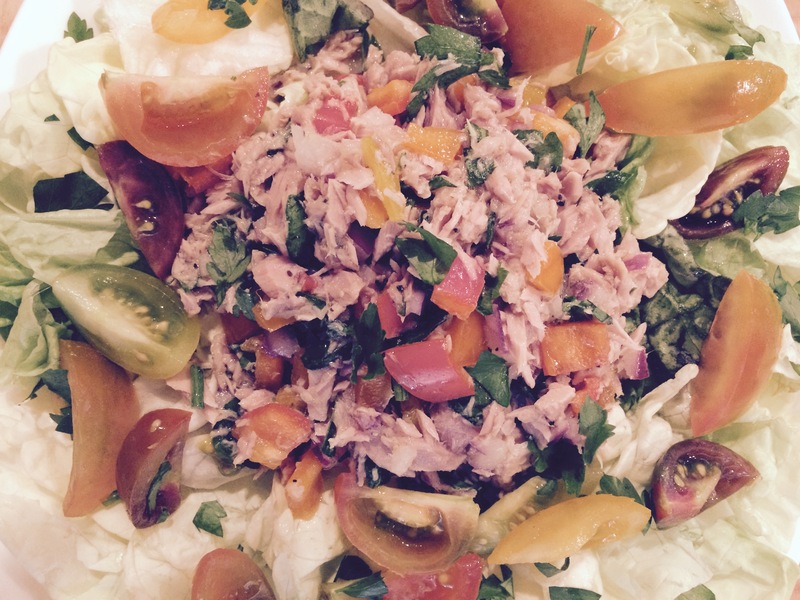 This terrific no-mayonnaise tuna salad is delicious, flaky and crunchy, and is a fantastic addition to a healthy diet. It is perfect for lunch, sandwiches, and picnics. Turn this salad into a sandwich, cut a whole-wheat pita pocket in half, toast and stuff with tuna mixture, lettuce and tomatoes and enjoy! Simply…terrific! – Add dry roasted unsalted chopped walnuts for a delicious and nutritious crunch. – Add a boiled egg per serving for extra protein. •	Drain water from canned tuna. •	In a bowl, whisk onions, oil, lemon juice, salt and pepper. •	Add tuna, bell peppers, and parsley and toss well. •	Spread lettuce on plate and add tuna on top of the lettuce. •	Scatter tomatoes and walnuts. Serve immediately. 1) Weight Control: Tuna is very high in lean protein and can aid in weight loss. 2) Reduce Risk of Heart Disease: Tuna is a rich source of omega-3 fatty acids. Research uncovered that unsaturated fats improve blood vessel function, lower blood pressure and reduce the risk of cardiovascular disease. 3) Boost Metabolism: Tuna is an excellent source of vitamin B-3 (niacin). It also has vitamin B-1, vitamin B-6 and large amounts of folic acid, which helps prevent atherosclerosis. All B vitamins help the body convert carbohydrates into fuel, which is used to produce energy. Happiness comes from within. One way to become happier is to capture positive emotions. Happiness is a mental or emotional state of wellbeing characterized by positive or pleasant emotions. You can pursue and capture happiness by following these simple ways to Be Happy! Make time for physical exercise. Even a 10-minute workout can boost your energy and mood. The Latinva Revolution fitness program includes 10-minute workout segments that are ideal for boosting your energy and mood. Not having time to workout is no longer an excuse! Get more quality sleep. According to some studies, not only getting enough sleep will make you happy, but being a happy person could help you get a good night’s sleep. Meditation is an ancient tradition that has been scientifically studied and proven to have a positive impact on our minds. It allows you to rest physically and mentally and will take you away from some of the challenges in your life. Love who you are and what you are doing, and don’t compare yourself to others. We are all wonderfully unique and have different things to offer. Focus on your strengths and laugh at your shortcomings. Have you ever seen an unhappy dancer? Dancing requires concentration and interrupts unhappy thoughts. When you dance, your body releases endorphins, which tells your brain to lessen your experience of pain. Smiling is contagious. When you smile, it makes others smile with you. Smiling releases serotonin in the brain, which gives you an instant mood lift. Tell your family and friends that you love them. Social events are really important to improving our happiness. Studies show that spending quality time with friends and family is extremely important for our wellbeing.